I apologize for the first part of this blog entry, it’s going to sound a bit whiny. In fact, it could go down as outright bitchy, grumbly, and moany. Unfortunately, it’s an explanation that needs to be made so that I can get to where I want to go today with my writing. For the first part of this week I could not walk. This is not an exaggeration I was in pain and my legs were so weak I could not stand up. I decided it was Sciatica, which I have had before in my life, and went about treating it the way I always had, with high doses of Ibuprofen and ice/heat packs. Except this time it got worse. I have never experienced pain like this before. 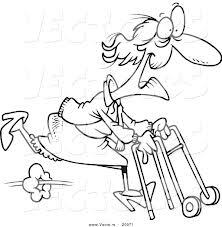 I had surgery years ago on my feet, and at that time I experienced the joy of crutches, so I knew what being immobile was all about. I gave birth to a child, and knew, without a doubt, what true pain was all about. I watched my own carpal tunnel surgery,and walked away the epitome of toughness, knowing what I was all about. This time around pain and immobility had me dumbfounded. I was unable to lift myself out of a chair. With a great deal of Morphine, Vicodin Flexeril, and Prednisone, and with the help of good friends, a patient and talented ER doctor, a caring and generous Chiropractor, and a slew of wonderful underpaid nurses, I am creeping around once more. Oh, then there is the walker. The walker. The universal symbol of old age. The icon of infirmity. I came out of the bathroom and there it was, Tuesday morning, waiting for me by the door. I cursed. This silver menacing arc of metal and plastic. It’s only reason of design is to bring support to a body filled to the brim with feeble muscles and bones. Image from Vectors Clip Art. Once you hit your 50’s you begin to accept the fact that your body isn’t what it was once. I see women and men, my age and older, who are remarkable specimens of human health and stamina. I know the have to work harder than ever to keep and maintain their bodies. I’m a little in awe of them, and a little ashamed I haven’t done the same. I don’t lift weights anymore, I don’t run or ride bike, and I don’t participate in aerobics. I tried Yoga for a while and liked it, but gave it up. It was too expensive. Since Tuesday, walker and I have been humbly rocking around our friends and family. We’ve been getting in the way of everyone, trying the patience of everyone, and reaching out to the gods on high hoping that we’re not looking like a crazy old woman to everyone. As I began this,I thought I was going to write about pain. It’s not about pain is it? It’s about ego. You spend your life trying to be as independent as you can,almost being smug about pulling yourself up by your proverbial boot straps. Then it hits you like a cartoon safe from a third story window: you are mortal. Your body will fail you on and off for a while, until it hits the final blue screen and you don’t reboot. The creaky knees, the eyeglasses getting stronger and stronger, and the white hairs encase us so slowly we don’t always notice them. Especially when the heart still feels 18. But when our body actually stops and says no, not today, subtly marches right past us, and we notice our mortality with greater alacrity. I don’t know. I don’t have the definitive answer. I guess we all have to find the answer on our own. More than likely, my decision will be different from yours. As of today, I will fight. I will try to exercise more, eat well, and every few weeks have Clairol or L’ Oreal visit. But the time will come, and I will have to let go of this body in crisis. I found out this week I’m not ready to spend all my time with walker. Age and dignity create an interesting dance, and one that I will need to learn the steps of in the next few years. I hope I can find some comfortable boots for that dance.